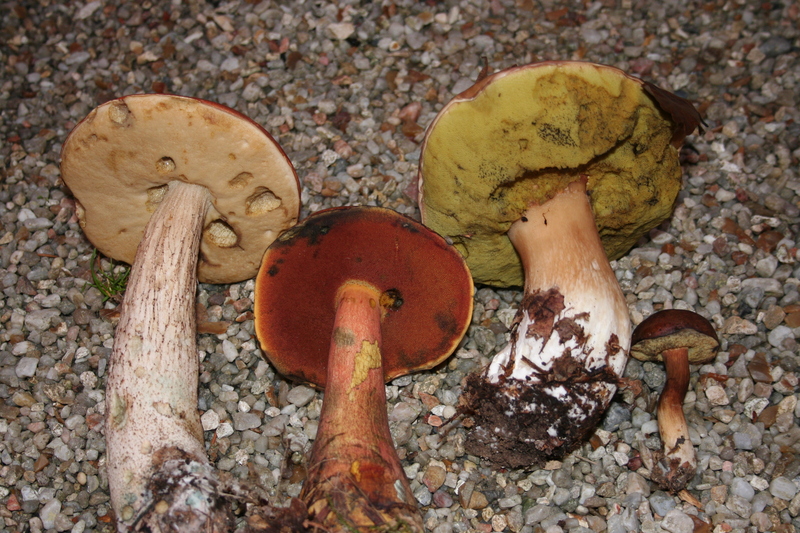 Just when we had given up finding anything other than Field Mushrooms, the continued mild, damp weather has produced a flush of Boletes of all types. Two days ago we were looking at a property for a client near Montrichard and stopped for a walk in the woods with the dog. 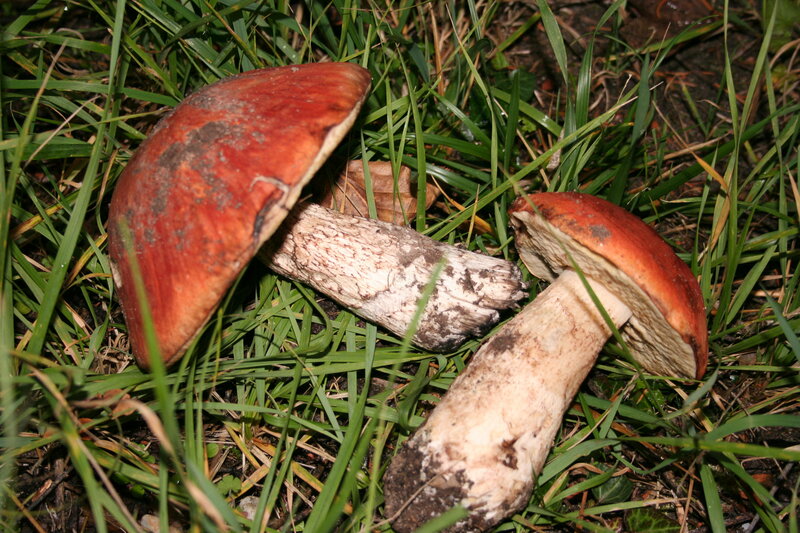 This trip produced a pair of Orangé or Leccinum versipelle, L. aurantiacum or perhaps L. quercinum, as we found them under Oak rather than Poplar. We eat them later with a chicken stew dish: wonderful! 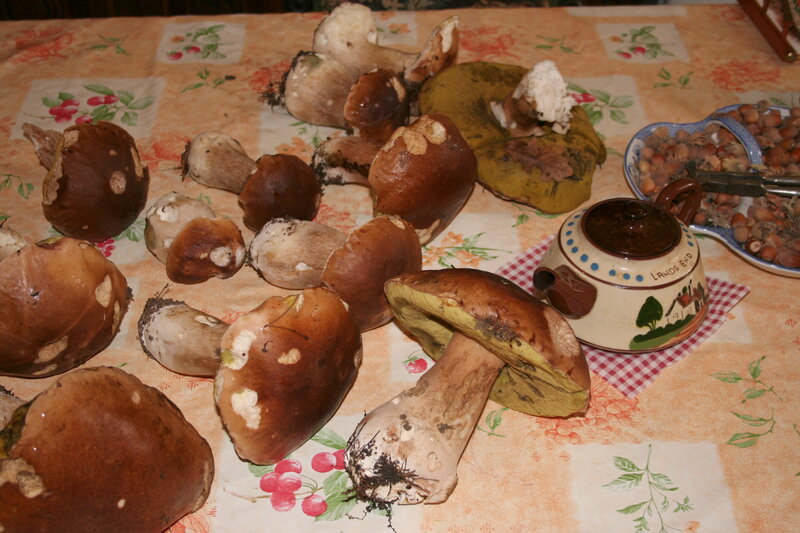 Today we were out in the woods at Chabris and came across a huge area covered with Ceps and other Boletus. We came back with kilos of the things which, at Euro 30 a kg in the market makes our little walk seem like a profitable venture. Chantal has spent the morning cooking, freezing and drying our haul and I am very much looking forward to dinner tonight. Out in the garden another free find; I had rescued some wild Cyclamen from in front of a JCB digging a trench for a new water main and, on another occasion, a plant from the woods where felling had just started. Checking on their progress this morning I remarked again on how different the two white flowering plants were when I spotted Cyclamen leaves pocking through brambles and weeds near our Sequoia tree. It seems we have our own patch of wild Cyclamen in addition to the two I have introduced. It will be fascinating to see how they perform in the next few years. I have started to plant out cuttings I have rooted in our nursery corner. The first of these came from the local school garden: Artemisia Powis Castle. I like the silver leaves, the scent and the way that leaves added to Vodka turn the drink bright green. I’ll bet they didn’t tell the kids that! This entry was posted in france, gardening, plants, wild flowers and tagged Artemesia Powis Castle, Boletus, ceps, Chabris, Cyclamen, food for free, wild flowers, wild mushrooms by ukhostland. Bookmark the permalink. I like mushrooms too. I like it in pizza and in some dishes. Your post is very informative. Thanks for sharing this one. I expected to have to get up at 4 in the morning and fight the locals for ceps; not at all. Most people don’t pick or are scared of them….just like in the UK. Great, more for us!